As we reflect on the different elements which made up the Great Parchment Book project in this continuing series of posts, we now turn our attention to transcription and textual encoding. Alongside the conservation and digital imaging work, a palaeographer, Dr Patricia Stewart, was employed by London Metropolitan Archives partly funded by the Marc Fitch Fund and some of the Great Twelve City of London livery companies to prepare a readable and exploitable version of the text. The aim was to produce both a transcription of the original text as found in the Book, the ‘original transcript’, and also a modernised version, the ‘modern transcript’ with an accompanying glossary. 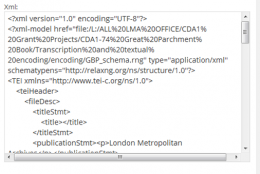 To enable the Great Parchment Book to be as comprehensively searchable as possible, it was decided to encode the text in XML compliant with the Textual Encoding Initiative. 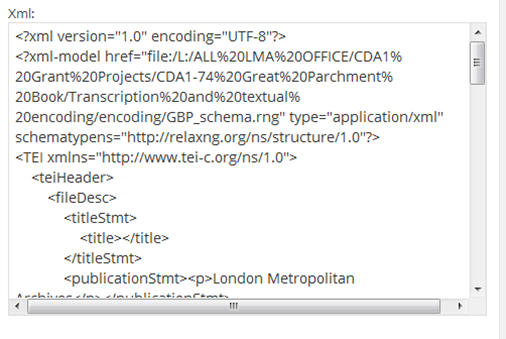 TEI is a set of guidelines which specify encoding methods for machine-readable texts. It is widely used by archives, libraries, museums and individual scholars to present texts for online research and preservation. Patricia already had some familiarity with TEI, but had to think about how it would work in the context of the Great Parchment Book, and to think about transcription conventions and methodology. To begin with, though, she had to learn about the historical and archival context of the manuscript and its structure and arrangement. There was also a steep learning curve getting to grips with Irish personal and place names and some of the less familiar terms used. Last but not least there was the distorted text itself which in places was illegible or even missing. Patricia was able to supply some text through her knowledge of how the manuscript was arranged and its use of formulaic text. 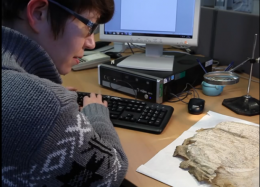 She was also able to re-order some of the folios and identify a few of the fragments. 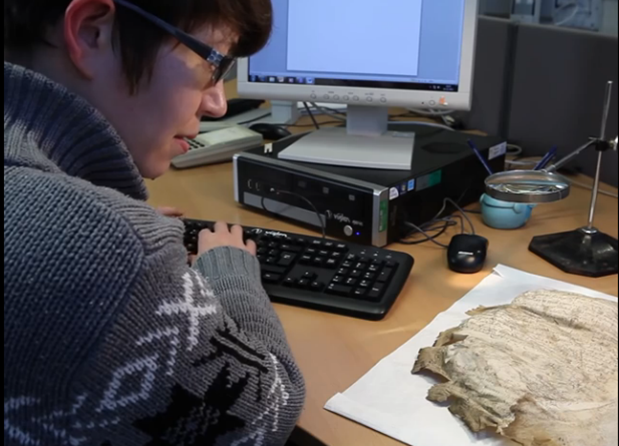 Patricia worked with Kazim Pal, the doctoral student, to test the flattening software as it was being developed to see whether it made deciphering and transcribing the text any easier. She also was involved in the discussions with the website designers Headscape on how the transcripts and glossary would be presented on the website alongside the original and flattened images of the individual parchment folios. This painstaking work took longer than expected and so the original six month project was extended to eight months running from September 2012 to May 2013 to enable the transcripts and glossary to be completed and uploaded to the website. Patricia continued to be involved in the project by presenting papers at events such as the Plantation Families: People, Records and Resources event held in Belfast and Londonderry on 27–28 September 2013 and the Great Parchment Book Day at LMA on 25 July 2014. You can find out more about the transcription and encoding of the Great Parchment Book on the blog (go to the end of the page once you’ve clicked the link to read in chronological order).